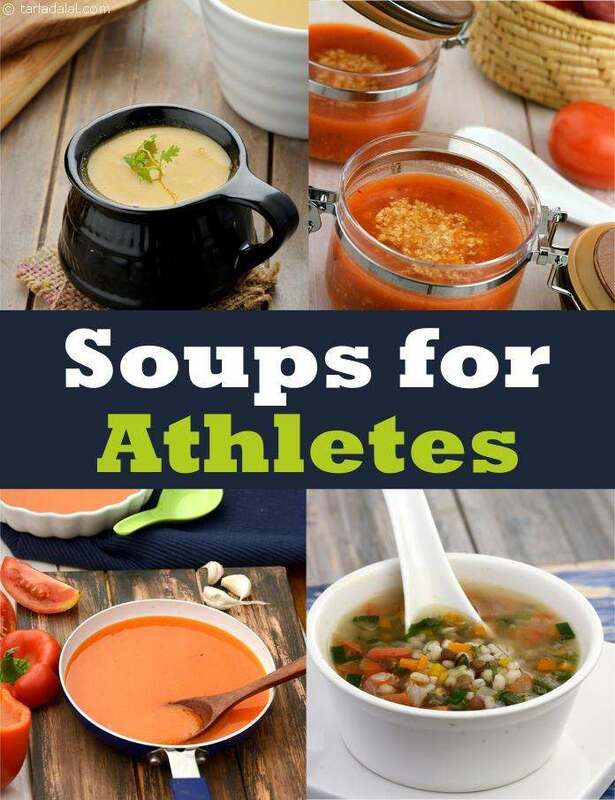 Soups for Athletes and Weight Loss. Soups are great if made with healthy ingredients. The biggest problem is when cooks use milk regularly in making soups. Milk contains saturated fat, a sugar called lactose which is very difficult to digest. The second problem with soup is cornflour. It's best to avoid cornflour in your soup as it will push up your blood sugar levels and slow down the fat burning process. Most restaurants toss some cornflour into their soups so beware of that. Here is a super tasty usage of barley in Nourishing Barley Soup. Barley is a great source of protein, iron and fibre and tastes good too. Another healthy soup which is easy for any Indian to make as we all love making our paneer at home. Whey Soup as the whey is got from the paneer you make at home. Its nourishing and tasty plus the soup has panner which has necessary fats and proteins for athletes. For Quinoa lovers, a must try is Lemony Quinoa with Baby Spinach cooked in a vegetable stock. Great combo of some amazing soups. Great to see that cornflour as a thickening agent not used and also no milk.